Ernest Petin, (1812-1897), was a French aeronaut from Paris who experimented with various means of flight. He came to America arriving in Boston in 1852, and furthered his research in Connecticut. Like many aeronauts of his day, he hoped to cross the Atlantic Ocean in a balloon. “M. Petin, the celebrated inventor of the theory of the aerial navigation, sailed from Havre for Boston, in the American ship Emperor, on the 14th instant, taking with him to the Unites States his three balloons, engines and machinery. It’s unknown when Mr. Petin made his first balloon ascension in the United States, but an advertisement in the New York Herald stated that Petin would make a “Grand Balloon Ascension” in one of his three large balloons at the Union Course on Long Island, New York, on May 21, 1852. 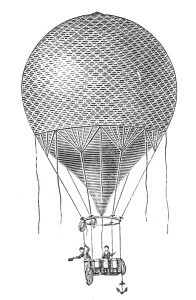 On July 4, 1852, large crowds had gathered at Bridgeport, Connecticut, to watch Mr. Petin make an advertised balloon ascension. Unfortunately, as preparations were being made strong winds pulled the balloon loose from its moorings and sent it crashing into the eaves of a nearby home where the fabric was torn apart. Petin suffered minor injuries. On July 23, 1852, Mr. Petin made a balloon ascension from Bridgeport, Connecticut, with two companions with great results. The Hartford Weekly Times pointed out that this was not the same balloon Petin was injured in on July 4th, which was described as “inferior” to the balloon utilized on the 24th. A Pennsylvania newspaper, The Weekly Lancaster Gazette, carried the same basic statement, however added that the event was to take place in New York. In August of 1852, Petin made another balloon ascension from Bridgeport, Connecticut, in a balloon measuring 25 feet long and 70 feet in diameter, with a boat attached underneath. With him were Gustave Regnard of France, and a Mr. Wood of Bridgeport. 64 men reportedly held the ropes securing the balloon until the signal to release was given. The craft quickly rose to an altitude of 10,000 feet and began drifting towards Long Island Sound. While passing over the Sound it rose to 22,000 feet where the temperature was recorded at 9 degrees below zero. The cold was intense, and one of the men, it was not stated who, was “benumbed”, and “fell into a profound sleep”. With great difficulty, Petin managed to open the release valve and descend rapidly to 13,000 feet. The balloon landed without incident at Riverhead, New York, a village on Long Island, New York. On September 6, 1852, Petin and three companions made another ascension from Bridgeport in what was said to be the largest balloon ever used in the United States. It measured 100 feet tall and 72 feet around, and contained 3,500 cubic feet of gas. It rose to an altitude of 23,500 feet as it was carried over Long Island Sound, and then Long Island itself before coming down in the Atlantic Ocean six miles from shore. Petin and his companions were rescued by members of the Coast Guard Lifesaving Station in Bridgehampton, Long Island. On October 14, 1852, Petin made yet another ascension from Bridgeport which ended with similar results as the previous trip made a month earlier. This time the balloon hit the water two miles from shore off South Hampton, Long Island, and once again Petin and his companions were rescued by the Coast Guard. The following year Mr. Petin began making ascensions in New Orleans, La.